Instructions: My card size is 5 1/4 x 7 1/4". Make card base and then cut a piece of 5 x 7" yellow cardstock and run it through the vagabond with the embossing folder. Glue down onto the front of the card. 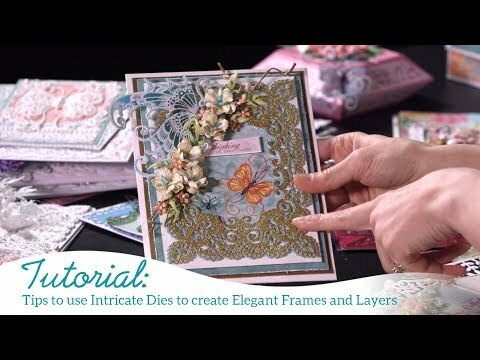 Cut a piece of white cardstock and cut out the Eyelet Lace Frame and use the Darice Adhesive Foam Strips to adhere it to the card front. Stamp, cut out and color the flowers and leaves and then run the roses through the rose shaping mold. Glue petals together to form the flowers. Use the Flower Shaping mold to shape the other leaves and flowers and then punch a hole in the center and add the stamen. Add a bit of hot glue to the back of the petals to hold the stamen in place. I took a sponge and dabbed a bit of glue onto the flower petals and then sprinkled the Crystal Clear and set aside to dry. When everything is dry place the flowers and leaves where you like and glue down with the hot glue gun.